The 26th Japan-U.S. 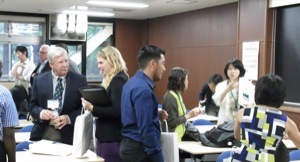 Teacher Education Consortium (JUSTEC 2014) will be hosted by Tokyo Gakugei University, Tokyo From September 18th to September 21st, 2014 . The Keynote speaker is Dr. Toshiakira Fujii Professor, Tokyo Gakugei University (Math education); member of the International Advisory Board of the Journal of Research in Mathematics Education; National Council of Teachers of Mathematics; Vice President, Japan Society of Mathematical Education. The Featured Speaker is Dr. Shigeru Asanuma, Professor, Tokyo Gakugei Univ. (Education); Board of the Japanese Society for Curriculum Studies; Board ＆ Editorial Board of Japan Association of American Educational Studies; Board ＆ Editorial Board of Japanese Society of Education for Individual Development. Follow-up from Dr. Toshiakira Fujii New! The JUSTEC keynote speaker Dr. Toshiakira Fujii was mentioned in the New York Times, July 23, 2014 (towards the end after jugyo kenkyu). This article "Why Do Americans Stink at Math?" 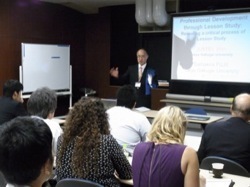 gives you an overview of math edication, core curriculum challenge in the U.S., and Lesson Study in Japan and the U.S..